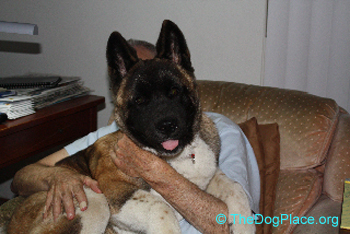 She was ‘only a pet’ but to this elderly WWII paratrooper, the Akita puppy was the key to life itself. 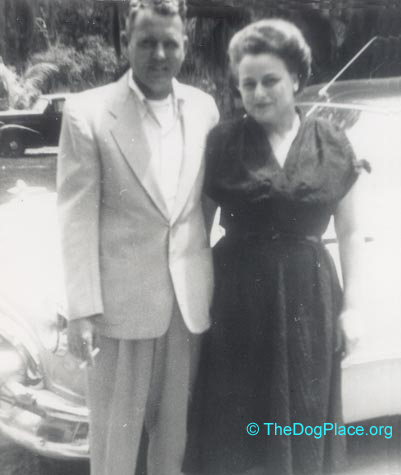 A short true story that validates why dog breeders do what we do. Show breeders get so wrapped up in anatomical details, breed standards, and club politics that too often, we forget what dogs mean to our pet owners. Sometimes we forget what they once meant to us! We rarely speak of the pets we produce, as though the fact that there were mere "pets" in a litter is shameful. Let me remind you why we're supposed to be breeding dogs. Let me explain about my mother and Roy. Mom was not well and my stepfather a total invalid. God forbid, "vegetable" would better describe Roy. Packed away was a trunk filled with reminders of his heroic service to our country. Purple Heart, Distinguished Service Cross, Silver Star, you name it, he had been awarded just about every honor. But a daily reminder of his service as a paratrooper in the famed 82nd Airborne Division of WWII or the "Big War" as he called it, was a steel skull plate, brain damage, a shell of a body, and daily medication to control seizures. 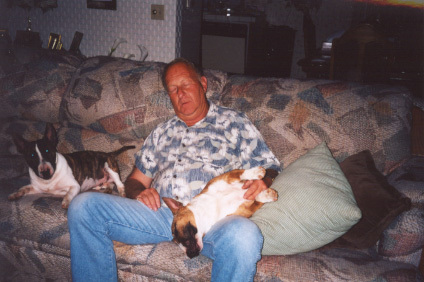 A few months before, mom and Roy had lost their thirteen year old German Shepherd, Duke. We had all dreaded the inevitable because Roy had begun to link himself with the aging dog. He said they were "just two old men". With Duke's crippled hips and Roy’s shattered bones it was evident that in some warped way, Roy felt his own life to be tied to that of his old dog. He was often overheard talking with Duke and remarks like "yep old buddy, ain't neither of us no good to nobody no more" were frightening to my mother. So it was not unexpected that when Duke died, Roy went even deeper into depression, something not well understood in the early 70s. He spent twenty out of twenty-four hours lying in never-never land in the back bedroom. His condition rapidly deteriorating, there were days when he could not be forced to the table to eat. When mom could get a neighbor or church member in to help, Roy was brought into the living room and settled in his favorite chair to watch the wrestling matches he had always loved. There he would dutifully sit...and sleep or stare into space. For eleven months, Roy had not been outside the confines of his home except for trips to the V.A. hospital. His medication had been increased to dangerous limits and still no improvement. It hurts now to remember those painful months but it's important that you understand how bad it was for Roy - and for my mother trying to cope. Upon our arrival Roy was assisted into the living room. Stimulated by our visit, he was bright and talkative for nearly an hour. Gradually, what mom said was his usual vacant expression took over as he lost interest in the conversation. Lunch was prepared and he fell asleep in his chair midway through the meal. We let him doze while we unloaded the van - and Key-Too. Key-Too. All thirteen weeks of her. Rambunctious, mischievous, troublesome, klutzy, inquisitive, demanding of love and attention. The puppy raced excitedly into the strange house. She didn't notice the old man dozing in the chair as she sniffed and snuffed and explored under the sofa, in the corners, and down the hallway. When she had quieted down, mom gently woke Roy. The moment was all we could have hoped for. He opened his eyes and although I hate to be melodramatic, it really was love “at first sight." But it was much more than that. There was some kind of understanding that took place. He extended a hand and she came to him, hesitant, ever so quietly, wondering and confused in her puppy way about this lump of a human whose only movement was a trembling hand. When he fondled her ears, she turned and licked his hand and although Roy didn't suspect at the time, from that moment on, she was his dog. He stared at her and she gazed quietly back at him. 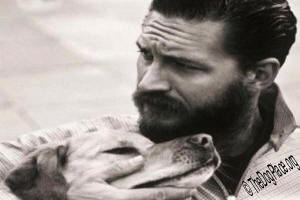 He smiled and then remembered we were present, never taking his eyes from the puppy, he asked her name. We told him Key-To Success O’BJ and he repeated it as best he could in his drug-slurred speech. Somehow it came out "Tay-Too" and Tay-Too it always was. We resumed conversation, careful not to mention the dog or why we had brought her. Roy soon tired and Bill helped him back to bed but before he closed the bedroom door, Roy asked if the puppy could take a nap with him. Mom shrugged her shoulders when I pointed out that Key-Too might not sleep and there were all sorts of things she could destroy in the privacy of Roy's bedroom. My husband ignored us, softly closing the door on the two of them. At supper, Tay-Too shared the TV tray that he had asked to have in the living room instead of in bed as was his custom. The puppy stole the slipper off his foot and laid her head on it, watching up at him. When mom took his tray away, she wiggled around to the side of his chair where his arm dangled limply. She licked his hand and he responded by tweaking her ears, and they both dozed off. None of us dared offer a comment even among ourselves. We left them in the living room and retired to the porch. Later that evening, she shared his bedtime snack and when mom fussed about crumbs in the living room and spoiling the puppy, he told her to just go back in the kitchen and leave them alone. We smiled. Key-Too slept in his room that night. She woke everyone bright and early the next morning, anxious to go outside. Nothing in his room had been touched but his slippers were under the bed where she had cuddled up to them. Roy got up with her and mom said it was the first time in nearly a year that he had gotten himself out of bed. He had breakfast, took his medications but refused the portion of his pills designed to send him to never-never land. Mom argued, he ignored her and instead asked "Tay-Too" what she thought about being brushed. The puppy watched him intently, cocking her head, seeming to hang on his every word. I had never seen this usually rambunctious puppy so quiet and attentive. He asked her again and she scooted closer to him. I asked mom if she had a brush and then laughed when she came back with the only thing she could find - her own hairbrush. Mom chattered and fussed about dog hair in the house as Roy ignored her and clumsily brushed the puppy. Amazingly she sat perfectly still for all of a minute before she grabbed the brush and ran with it! He laughed at her antics and we exchanged glances. He hadn't laughed like that in months. The next day we packed to leave and although Roy was in his chair, he was very quiet. As we carried our suitcases out, he called "Tay-Too" over to say goodbye. We stood quietly by the door, not quite sure how to broach the subject of leaving her with them. We couldn't hear what he said to her as she sat looking up at him but when she eased onto his lap and licked his face, we saw his hands tremble and the tears roll unchecked down his whiskery cheeks. Mom knelt by Roy’s chair and asked if he'd like to just let her stay. He looked up at me and I nodded. His eyes cleared to the steel blue I remembered from long ago and he pulled himself up straighter in the chair, looked at my mother and told her that they couldn't afford a dog, especially such a fine show dog. Then, sinking back down in his chair, he mumbled, "We can't take care of ourselves Mother, how can we take care of a dog?" Mom took his hand and told him we wanted to give Key-Too to them and that it did seem she was a sensible puppy and they could manage her care if he wanted her to stay. "Tay-Too", he corrected. He fell silent. His eyes misted and we realized he was thinking of his old German Shepherd, Duke. We all were. When he finally looked up at me I could only smile and nod past my tears. Tay-Too, confused by the strange silence, nuzzled his hand for reassurance. We pretended not to notice his tears as he pulled her closer and muttered aloud, asking her if she'd ever be as big or as smart as "Old Duke". The rest of the story is what breeding dogs is all about. O’BJ Key-Too Success never became a champion. What "Tay-Too" did do was what every dog is born to do. She brought love and laughter into a home that desperately needed both. She gave them security and protection. She gave a new lease on life to two lonely old people who needed her more than anyone had realized. Three days after we left her, Roy took his brand new puppy and his brand new pin brush and the two of them went into the backyard to groom. "Tired of your Mother's fussing about her hairbrush and hair in the house" was Roy's comment on the phone. Not only was it the first time in months he had talked to anyone on the phone, it was the first time in nearly a year that he'd ventured out of the house other than to be driven to the V.A. hospital. By the end of the second week, he informed mom that he and Tay-Too were going for a walk and demanded she unpack Duke's leash. Mom protested and rightly so, for he was still feeble and unsteady on his feet - and the puppy wasn't leash trained. He ignored her warnings and the two of them proudly walked two blocks that day. Mom called me in tears of joy. She described how the puppy never fought the leash, how she watched from the window as they slowly made their way down to the corner and back, Tay-Too walking ever so carefully by Roy's side. By the end of the next week, the two of them had made it all the way to the 7-11 store five blocks away! They became such "regulars" that the cashier no longer bothered to call mom to reassure her they had arrived. The manager always had a treat ready for "Tay-Too" and a free cup of coffee for “the war hero.” People stopped in at the little store when they saw them there. Ma Bell loved us. I talked to my mother more than I had in years. I heard amazed "progress reports". Not the typical proud stories about what a lovely front the puppy has, how much it weighs, or how well it did at training class. Oh no, Key-Too’s reports meant ever so much more. 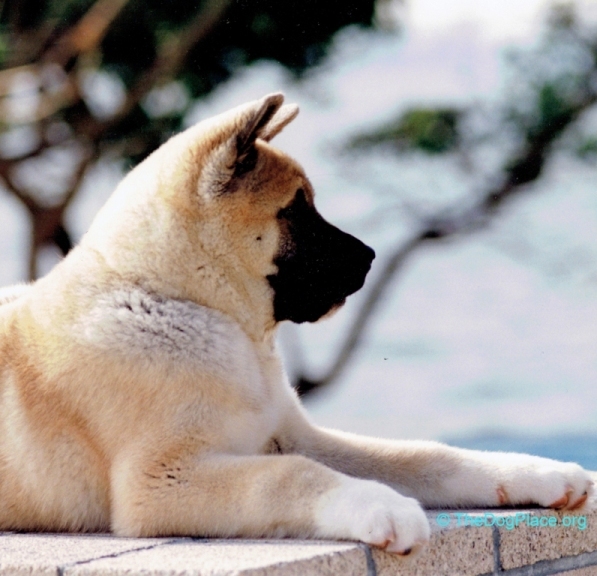 Neighbors stopped them on the street and Roy proudly told them she was an Akita, a real show dog, a rare Japanese breed, and who knows what else he told them in his new found pride and enthusiasm. Through the puppy, he made new friends and never tired of telling them about the dog or "the Big One, WW2." And you know, somehow they never tired of listening. Everyone loved Roy and all that he stood for. You’ve seen it, the hero worship grown men show to the old veterans. Now it had become "Captain Carter and Tay-Too". They were an item. 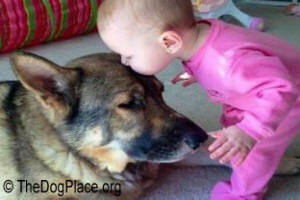 She became more than just an old man’s companion, she was his nurse-therapist and guide dog. She understood how uncertain his balance was and watched him carefully at curbs. Her powerful shoulders saved him some bad spills. She learned early-on not to jump on either of them. Akitas can be stubborn but Key-to learned useful little chores like getting the paper, fetching his slippers, taking the mail out to the mailman who began to stop his little truck and toot at the Carter residence. She guarded their sleep and protected their home. She greeted the pastor with "reverence" and all their guests with respect but she barred the door with a deep snarl when a strange man knocked. Key-Too’s favorite resting place blocked the narrow hallway but she learned not to move a muscle when Roy carefully stepped over her. She escaped through the sagging back yard fence but when she realized how terribly it upset her people, she never did it again. Oh there were problems. Key-Too dug immense holes in the back yard and Roy fell in them. She left balls and toys scattered around and Roy tripped over them. But within a few months, she was big enough and understood enough to guide him around such obstacles and when he did fall, she was instantly at his side, offering her strong back for him to pull himself up. Other than booster shots, her only trip to the vet was when she attacked mom’s blooming cactus. It was unexpected expense but they proudly managed and mom said it was worth it for Roy not only went with them to the vet, he insisted on driving on the way home! It was his first time at the wheel in over two years and although my mother was scared to death they made it safely - and that certain bottle of pills which had prevented him driving in the past sat untouched in the medicine chest from then on. As Roy's condition improved, my mother's began to worsen. When she went on oxygen, Key-To suspiciously avoided the tank and hoses but elected to sleep in mom’s bedroom. When mom had the inevitable bad days when she couldn't look after Roy, Key-Too did. When my mother hurt her back in such a way that she couldn't move her legs and Roy was fast asleep and couldn’t hear her cries, Key-Too barked at Roy until he awoke and went to help my mother. Key-To learned to accept what from a dog's perspective, seemed like threatening actions of the visiting nurse who bent over my prone mother. She learned that when the nurse caused my mother pain, she was not to interfere. When mom had to be hospitalized, Key-Too cried for her and paced the floor, and then would go sit with her head on Roy's knee, putting her own confusion aside to try and comfort him. Key-To Success O'BJ was never a show dog. She was a fat, spayed pet. I would gladly give up all our Best In Show winners in exchange for just one more pet like "Tay-Too." Wouldn't you? © Barbara J. Andrews, reprinted from The Dog Newspaper 1991, Canine Chronicle June 1992, Kennel Review Magazine 1993, ShowSight Magazine 2002, 2018 revised and illustrated. COMMENTS on how you feel dogs are different from other animals. How to introduce the family dog to the new baby or puppy?